Different processes are used for wastewater treatment depending on the size of the sewage treatment plant. Flottweg decanters for thickening and dewatering sewage slurry are used in various stages of wastewater treatment. Sewage slurry that has been de-watered using a decanter is suitable for all possible methods of further use or disposal – whether in agriculture, incineration or landfill. Flottweg decanters can be adapted to all conceivable process engineering requirements. Thanks to decades of experience and consistent further development, we achieve the best dewatering results, whatever the sludge! Thickening sewage slurry means concentrating surplus slurry produced in the biological stages from 5 to 10 g/l total dry solids to 5 to 8%, before it is pumped into the digestion tower. The slurry volume is reduced by 90 to 95% in this process. 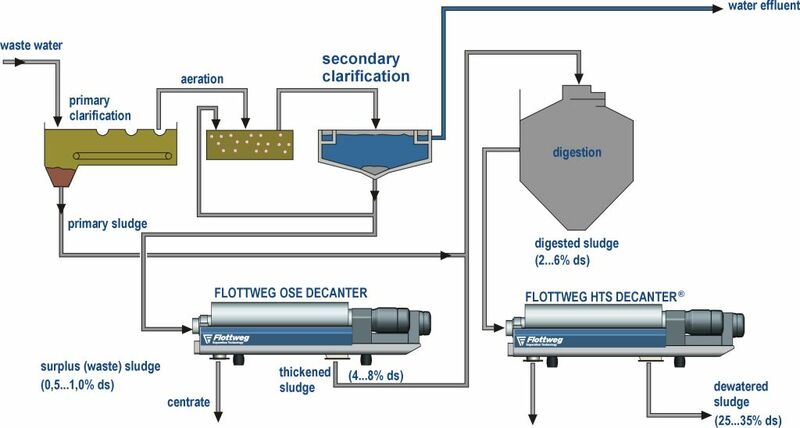 The Flottweg OSE decanter (OSE refers to optimum sludge thickening) has been designed for this purpose. It is characterised by its high performance, reliability and efficiency. The latest studies into fixed costs (capital and personnel) and variable costs (electricity, water and polymer consumption as well as spare parts) prove that the decanter offers decisive advantages compared to other thickening units. Irrespective of whether the sludge will be transported, recycled, taken to landfill or incinerated after dewatering, it is decisive for it to be as dry as possible. Other important factors include economical polymer, energy and water consumption as well as a low requirement for spare parts. The optimum solution for this is the Flottweg HTS decanter for dewatering sewage slurry. The decanter for throughflows from 10 to 180 m³/h offers decisive advantages compared to other units.